A three star walkthrough for the first ten levels. 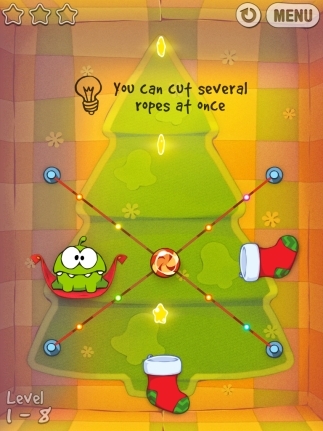 To celebrate the looming festive period the fabulous Cut The Rope: Holiday Gift is back on the App Store, and it won't cost you a single cent to download either. We'll be bringing you a complete, three star walkthrough for all of the holiday content this week. To start things off, here are all of the three-star solutions for the first ten levels. Cut the top rope and let the candy fall. It will pick up the second star on the drop, then bounce to the right to pick up the last star. 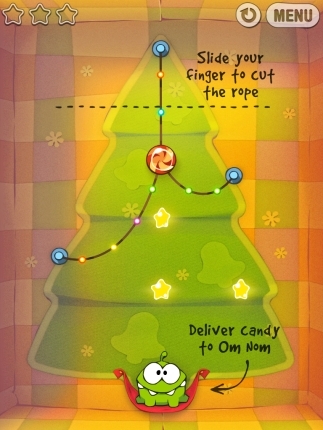 Cut the rope on the right-hand side and the candy will drop into Om Nom's mouth. Cut the uppermost rope and the one just to its right. Now cut the upper left rope, then the right-hand rope once the candy's dropped. It will swing to the left to collect the star at the left of the screen. As soon as it's done that, cut the left-hand rope and the candy will swing to the right to gather the last stars. Once you've caught the last star, cut the final rope to drop the candy towards Om Nom. 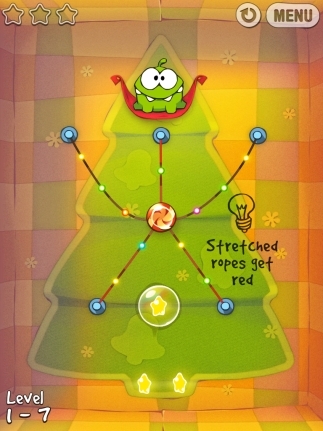 Cut the left-hand rope so that the candy swings and collects the first star. It will then acquire the bubble. Let it rise until it's stopped moving and has scooped the second star. Now cut the rope so the candy floats upwards. 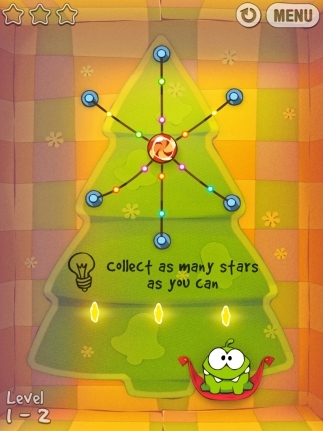 As soon as it's passed over the final star, cut the final rope to have the candy drop down. A little careful timing is all that's needed to pick up all three stars here. 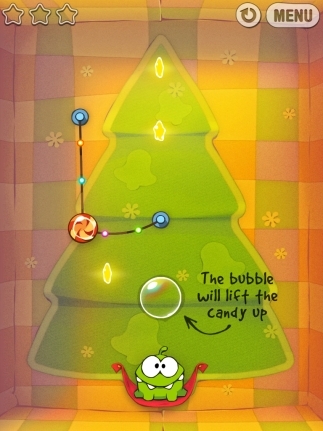 Let the bubbled candy rise up until just before it hovers over the uppermost star, then swipe the rope to (hopefully) gather all three stars and drop into Om Nom's mouth. A couple of attempts are all you should need here. Cut the left-hand rope and you'll automatically get the first two stars. As soon as the candy reaches the Christmas stocking, it'll be sucked in and emerge from the second stocking before landing in Om Nom's mouth. 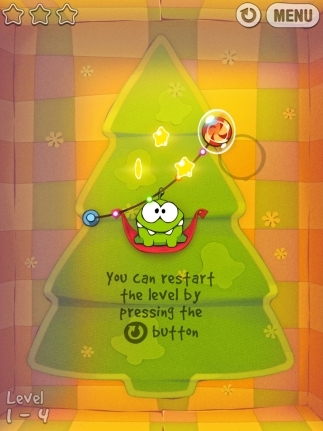 Cut the only rope on the screen and the candy will fall, picking up the first star as it falls into a bubble. Let the bubble rise a little, then pop it. It will land in the first stocking, then fly out of the second in an arc, collecting the final two stars along the way before arriving at Om Nom. Cut the upper-left and upper-right ropes, then the uppermost rope to collect all three stars and get the candy in a bubble. Cut the two remaining ropes swiftly, one after another, and the bubble will rise up to where Om Nom greedily waits! Swipe through the two left-hand ropes with one action. 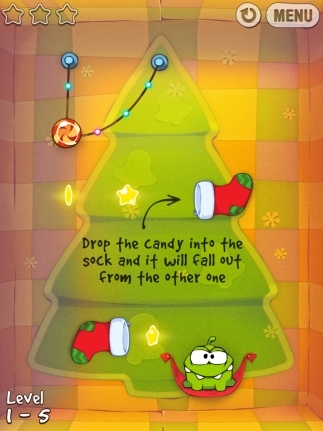 The candy will swing through the right-hand Christmas stocking, then fly out of the stocking at the bottom of the screen, collecting all the stars along the way. It will then fall back into the stocking and shoot straight towards Om Nom. Tap on the right-hand air cushion to blow the candy towards the left-hand bubble. Once you've picked up the second star in the middle of the pack, tap the bubble to drop the candied rope. While it's falling, tap a few times on the left-hand air cushion to send the rope swinging towards the remaining air bubble. As the candy travels upwards, sever the rope. 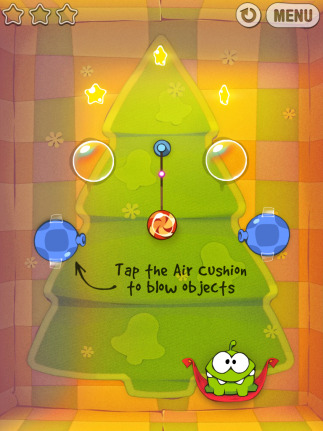 Once you've collected the last star, pop the bubble to drop the candy into Om Nom's mouth. 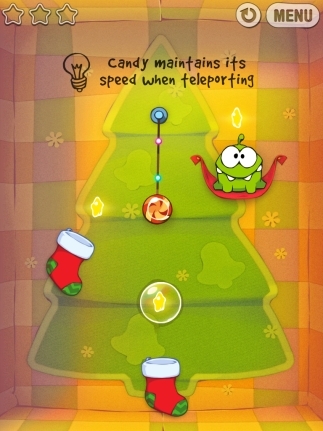 Cut the rope to the right and let the candy swing downwards. 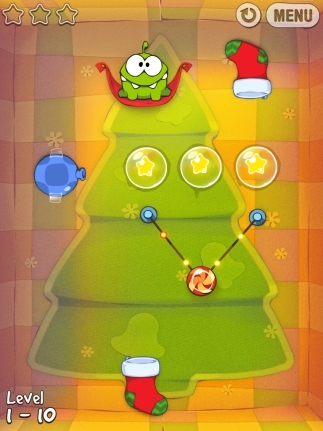 Cut the rope so that the candy lands in the first stocking, collecting the first star and falling into a bubble. Let the bubble rise back up through the stocking, and keep going until you've picked up the second star. As soon as you've picked it up, tap away at the air cushion to move it through the final star, and into the mouth of the stocking. From here, just let the candy carry on rising up towards Om Nom.